Radiologists at the US Open 2015 Tennis Championships in Flushing, New York? Yes—and not just in the stands among the spectators but working the matches as medical staff. Radiologists from Mount Sinai Health System in New York worked alongside orthopedic surgeons and sports medicine physicians to diagnose and treat players who experienced muscle, bone, and joint injuries during the two-week event in early September. Radiologists were invited to be part of the onsite medical team, offering their expertise as well as the latest portable, laptop-sized ultrasound. "Portable ultrasound technology has become so advanced that it can provide a much clearer image of muscles and tendons allowing for better detection of injury," says Carlos L. Benitez, MD, director of musculoskeletal imaging at Mount Sinai Roosevelt and Mount Sinai St. Luke's, an assistant clinical professor of radiology at the Icahn School of Medicine at Mount Sinai, and a leader of Sinai's radiology team at the US Open tennis championships. The advantage of having the radiologists at the point of care, Benitez says, is that they can use the ultrasound machine to do static and dynamic on-the-spot bone, muscle, tendon, and joint examinations and help diagnose—and possibly immediately treat—players with injury complaints. The Mount Sinai radiologists were scheduled to be at the Open for at least six hours a day and were "ready for anyone who needed us," Benitez says. Benitez finds it remarkable that today's portable technology allows physicians "to treat patients quickly, efficiently, and more cost-effectively than ever before." Portable ultrasound technology "now offers high quality musculoskeletal images and a mobility that you can't get from an MRI machine, which offers only static images with the patient at rest," he says. What others also may find remarkable is that radiologists perform the full ultrasound examination and deliver care onsite. Point-of-care ultrasound does not always include the radiologist, since it can be performed directly by the treating physician. As the role of point-of-care ultrasound has grown in the emergency department, cardiac care, ICUs, orthopedics, and other doctor's offices, radiologists have been fearful of losing their turf, says John S. Pellerito, MD, vice chairman of clinical affairs for the department of radiology at North Shore University Hospital, North Shore-LIJ Health System in New York, and a member of the American Institute of Ultrasound in Medicine Board of Governors, membership committee, and clinical standards committee. The presence of radiologists at the 2015 US Open is an important new event, and part of a growing number of examples of members of the specialty coming out from behind their workstations in their reading rooms and participating in point-of-care treatment for patients just like other specialists, Benitez says. Pellerito says he was an early adopter and has performed point-of-care ultrasound for more than 10 years—ever since the portable machines were made available. He often goes to the emergency department or critical care units at the hospital to perform bedside ultrasound. But he realizes that delivery of care by a radiologist is the exception rather than the rule in today's world of health care. Paul Mullen, general manager of Point of Care Ultrasound for GE Healthcare, which was used at the US Open, agrees that the vast majority of practitioners performing point-of-care ultrasound are not radiologists. But Mullen sees where radiologists can add value to point-of-care ultrasound and have an advantage if they are the ones performing it. Nonradiologists use point-of-care ultrasound as a flashlight, to better see what's going on with the patient, Mullen says. All they need is to "see well enough to take appropriate action," Mullen says. Radiologists can use the point-of-care ultrasound "more like a camera" to determine what's happening with the patient and make an image or "beautiful picture that is compelling" to convince the treating physician what needs to be done to correct the problem. The point-of-care environment isn't always the controlled dark scanning room that the radiology community is used to, Mullen notes. "They are used to working in an imaging suite with proper lighting and the patient in a bed. The radiologist is seated at the best height for acquiring the image. At point of care, it might be a bright room with all kinds of noise and distractions and the person holding the transducer is standing. It's a very different kind of experience for radiologists." Benitez agrees that radiologists can add value to point-of-care ultrasound, particularly when it comes to the musculoskeletal arena. Ultrasound is a good choice for imaging muscles, tendons, and joints because it's possible to take dynamic images, he says. When performing the ultrasound examination, the radiologist is able to passively or actively move the patient's joints to determine the patient's range of function and injured tissue strength under stress. "Some problems or injuries are more evident when there is motion and stress applied under controlled conditions," Benitez says. "The other imaging modalities, such as MRI, CT, and radiographs, don't offer this type of dynamic testing. Only fluoroscopy can approximate this but at the imaging centers and with patient exposure to radiation." A radiologist at courtside can interpret the exam and help determine, together with the treating physician, whether an athlete can return to the court and continue play or must stop and seek treatment for an injury. "As radiologists," Benitez says, "we have both the anatomy knowledge and ultrasound machine skills to provide a more comprehensive interpretation of the images." Also, Benitez adds, when the radiologist is onsite and performing the scans, the sports medicine and orthopedic physicians "are free to spend more time with their patients." Radiologists in the field are able to take a short clinical history and perform a targeted physical examination before scanning, an important medical process to arrive at a more definitive diagnosis, Benitez says. "Patient contact is a luxury that the radiologist doesn't always get when working in the dark room. In general, direct contact with the treating team and a more definitive diagnosis are key elements to streamline patient care." Mount Sinai radiologists also are coming in direct contact with patients who aren't athletes, Benitez says. He recently had a patient who was referred to the radiology team at Mount Sinai Roosevelt after her orthopedist identified a cyst in her calf muscle. Located very close to an important nerve, the cyst caused pressure and numbness in her leg. The delicate location, confirmed by ultrasound, required precise needle localization for aspiration and a steroid injection treatment. Benitez performed the procedure guided by ultrasound. At the end of the procedure, the patient could watch the screen and see the replay of the needle going into her cyst. She was relieved to know the procedure was done properly, with the needle entering at the right location and the cyst disappearing after aspiration, Benitez says. The patient's orthopedist referred the woman to Benitez because he did not want to perform the procedure blind, he says. The procedure was done as an outpatient at Mount Sinai Roosevelt. However, Benitez anticipates that in the future, radiologists will perform more procedures of this type with portable ultrasound machines outside the hospital, in doctor's clinics, and maybe even in patients' homes. Pellerito says he always considered the radiologist to be the original point-of-care expert in ultrasound. "Some radiologists have always been available in the setting where ultrasound needs to be performed, whether the emergency room or the ICU or the hospital bedside," he says. "I am a practicing radiologist, but to me the point-of-care ultrasound is not a new concept." The reason that nonradiologists have taken over ultrasound at point-of-care, he says, is that radiologists haven't always been available. "So the nonradiologists are learning ultrasound to fill a void." The radiologist's job, Pellerito says, is not to object to other specialties performing ultrasound at bedside, but rather to help those who aren't radiologists perform ultrasound at bedside correctly. "In certain settings it makes sense to have a nonradiologist perform the ultrasound—you can't have a radiologist at every site all the time. Many nonradiologists are monitoring patients in the ICU or other settings and it makes perfect sense for them to do so as long as they're adequately trained—and that's where the radiologist has a role." The radiologist needs to work alongside his/her nonradiologist colleagues to make sure they are properly trained, that their equipment is properly calibrated and of high quality, and that they are properly documenting the images they acquire. 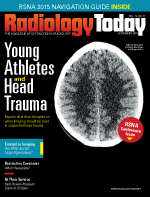 "One aspect of the American College of Radiology's Imaging 3.0 program, which is designed to help radiologists to adapt to how they manage their practices, patient care, and their futures, is for radiologists to be more available to provide services where needed, training when necessary, and to demonstrate their expertise," Pellerito says. "If radiologists consider themselves experts in ultrasound, they have to prove they are, as the modality is used by nonradiologists." Bill Moreau, DC, managing director of sports medicine for the US Olympic Committee (USOC), sees a role for radiologists in the Olympic Games that's not necessarily onsite but close to it. The USOC relies heavily on ultrasound to investigate any physical complaints its elite athletes may have or to determine their readiness to return to action after an injury. Ultrasound is not an easy modality, he says. "There are two components, the science of setting the machine correctly as well as obtaining the correct views, and it's really very user-dependent." Musculoskeletal evaluations with ultrasound take particular expertise, Moreau says. "Not all radiologists are interested in musculoskeletal ultrasound. Just like any art, it takes a dedicated interest and practice to become extremely proficient in interpretation of the images." In addition, Olympic athletes are a very mobile population—Olympians are perhaps more mobile than any other group of patients, except for the military, that health care providers have to care for, Moreau says. To solve the issue, the USOC has specific radiologists who are experts in musculoskeletal ultrasound and with whom it keeps in close contact. Some of the experts are local to where the games are held (Vancouver, Canada in 2010, London, England in 2012, Sochi, Russia in 2014, and Rio de Janeiro, Brazil scheduled for 2016) and some are at home in the United States. The radiologists are able to log in through the USOC's EHRs and PACS to review the images and provide additional interpretations. "It's virtually impossible to have a radiologist every place we go," Moreau says. However, "we have the ability to utilize our radiology partners who are key components of our sports medicine team by leveraging the abilities of today's technology." The onsite team feels comfortable allowing an athlete to return to action if the ultrasound results show "it's something benign or negative." If it is anything but, "we like to have a radiologist provide the interpretation for us," Moreau says. "That's really a key component to make sure we end up with the right assessment from the imaging studies." At the London 2012 Olympic Games, athletes had 392 ultrasound exams, compared with 405 X-rays, 79 CTs, and 835 MRIs, according to Moreau. Benitez likes that the radiologists' presence at the Open tennis championship gives them the opportunity to come out of the darkroom and have direct patient and treating doctor contact. In a recent study performed at his institution (Mount Sinai Roosevelt and Mount Sinai St. Luke's), Nii Koney, MD, and colleagues identified that only up to 30% of patients actually know that a radiologist is a medical doctor. "It's important for patients to know that the radiologist is not only an important member of the medical treating team but can also be a health provider who may oversee their medical care from the initial visit to treatment when image-guided interventions are required," Benitez says. — Beth W. Orenstein is a freelance writer based in Northampton, Pennsylvania. She is a regular contributor to Radiology Today.